"It’s a family owned company - I’m the third generation - and my grandfather is full of quotes, and one of them is 'Never tell a man what to do; tell him what you want done and be amazed by his ingenuity.' He would bite your head off if you made a mistake, but at least the door was open for someone to try something different. So that’s really our foundation in continuous improvement." I love this quote. This is the foundation of a strong culture of continuous improvement - empowering your employees to make their own decisions, and trusting that they know best how to do their work. In this video, Matthew Cannistraro shares this story, along with how the improvement culture at Harrington Air Systems, a sheet metal contracting company that is partnered with Cannistraro LLC, has changed over time. "As the company got bigger, maintaining [an improvement} culture became very difficult without a structure, and so our first attempt at rolling out a set of Lean principles for managing continuous improvement and then tracking it was with a Google Form. The form submissions went into a spreadsheet that you could kick out into Excel to do some really bare-bones analysis on it." He goes on to say that this Excel method was difficult to do and lacked visibility into what was going on in the organization. They initially emphasized that everyone was to come up with a single improvement, which compounded the problem of understanding and spreading the improvement culture. After about two years of this method, the program had completely stalled out. At its peak, they were getting about thirty improvements per month from an office of 100 people. They were happy with that success, but it just wasn't sustainable. 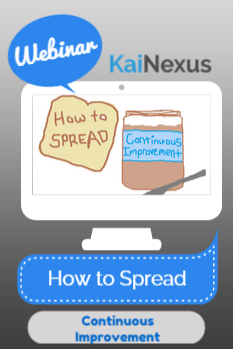 When they heard about KaiNexus from a Lean consultant, they were eager to access the platform to get instant feedback on how continuous improvement was going. They knew that they'd be able to see where their bottlenecks are, which departments were really doing well, and to recognize the employees that were successfully improving their daily work. As Cannistraro puts it in the video, "We have this energy for continuous improvement that we couldn't harness; maybe this software could give us some structure to support it and to really encourage it in a way that we haven’t been able to do in the past." "In the last couple of months, we’ve seen our rate of change start to accelerate. And we’ve seen month over month an improvement in the rate of improvements coming in. That’s been really great to see." We've seen our rate of change start to accelerate. How did KaiNexus drive an increased rate of improvement? "I think what’s triggered that is that there has been a lot more interest from the upper-level management in our success in KaiNexus. They’ve been able to get the information really quickly and even chime in with comments such as “What’s the status here,” “How’s it going,” or “Do you need help with anything.” When the CEO writes that to someone who’s like a production worker, it really makes them feel as if their improvement project is cared about." There's been a lot more interest from the upper-level management in our success in KaiNexus. What else is in the process? Their leaders take the time to check in with people, showing their commitment to and support for their improvement efforts. KaiNexus gives them the insight they need to know where to chime in and makes it easy for them to stay involved with improvements on the front line. It enables leaders to "identify which managers are managing well and which ones aren’t; which ones are empowering their employees to make change and which ones are assigning to many improvements to themselves." "All this stuff was going on under the surface and holding us back before but was totally invisible. In order to find out about it, it would take a morning of conversations to figure it out. And that’s all been mostly eliminated with KaiNexus. You still have to go figure out more of the details of what’s going on but our managers are empowered; the upper-level managers are empowered to see a really quick snapshot of the health of the improvement culture." Managers are empowered to see a really quick snapshot of the health of the improvement culture. Watch the video for the complete interview, and contact us with any questions! Check out this free webinar to learn how to spread improvement in your own organization.